Sometime over 6 months ago, I planned on heading to Tampa for the Publix Gasparilla Distance Classic. This was in the midst of a large grant writing project that was to go in in January… that is now going in in April. I had also decided Siesta Key was the place to be for some rest and relaxation before the race. So I booked the flight, booked the rooms, registered for the race and the weekend was set. I got in Wednesday. I was doing okay until I wasn’t. I got off the plane and saw Cigar City Brewing immediately and instantly thought back to those layovers that Dustin and I would go there for a beer (or 2) and Cuban sandwich. I could see us there after Puerto Rico 70.3. I remembered what we talked about. I teared up. They were good memories. I headed to Siesta Key, checked in to my place. Realized I am an awesome hotel picker (aside from that one time for Augusta 70.3) and headed to the room then straight to the beach! Took a little walk and just relaxed. I live like a half mile from the beach now and I rarely do that now. But Siesta Key has beautiful water, even on a bad day. Katie joined me – I also picked this place because I knew it was pretty close to my friend Katie’s house. We kept it low key that night. Went to a great little coffee place the next morning – Lelu’s. It’s been a while since I had coffee that good! 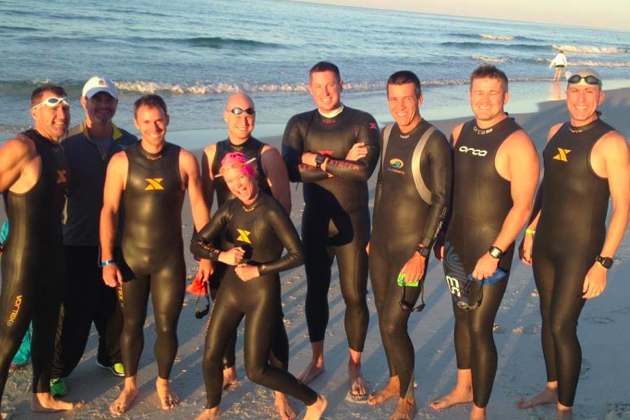 We shopped around for a while and then I needed to get an open water swim in… of course I packed my Roka wetsuit… I brought the sleeved one since I hadn’t worn it yet – Waco 70.3 was canceled and it still had its tags on it! Oops! haha. The water was perfect! And just the way I like it, with a side of murky! 15k – It was humid which I’m used to; but, we have winter here in Galveston and while most days it is 100% humidity, it was also kind of warm in Tampa. It was weird, I am used to getting a call or text from Dustin saying have a good race, you’ll do great, etc. I knew I wasn’t getting that but I also was thankful my iPhone had that glitch and I had his voicemail from the Houston Half Marathon morning. I listened to it, I cried. People probably thought I was crazy. I was having a pretty good run (aside from random tears) until I realized I blistered up my feet. This girl hates socks. I have NEVER sweated the way I sweated this weekend (and thank goodness I packed my Aloha bags for the wet clothes). That was around mile 6… at mile 7, I got the push I needed when Caleb (one of Dust and I’s friends) texted me, “Good Luck! You’ve got this” – we had had a little talk the day before about stuff. That came in at the most perfect time though… I pushed through and when I got to the finish Katie and her husband, Jeff were waiting on me. I became so emotional coming into the finishing chute. I ugly cried in Katie’s shoulder and told her how much I miss him but how much I loved them for being there for me. I had 5 blisters to deal with. Half Marathon – Sunday came and it was EARLY. We had a start of 6:00am; that’s 5:00am Texas time. I had moleskinned up my feet that morning & put socks on. Hoping for the best but prepping for the worst. It was HUMID. I knew I should have opted for a different top – cotton on a hot, muggy day is not your friend. I felt a little more at ease starting the half marathon. According to Travis, I had my second fastest 10k since he started coaching me and this was on tired legs. According to my Garmin, I had my fastest mile time since 2016. No clue where that came from but I was happy to hear it! Halfway through, I spotted a couple triathletes and talked to them a little bit. You know, the usual, oh what Ironman’s have you done? To hear them surprised I’d been out there just as much as they had been – ugh. The best surprise on the course wasn’t Meb – I mean that was cool but it was seeing Heidi! I met Heidi in New Orleans when her husband, Scott, was at the same USCG Air Station as Dustin. Dust and her trained for Ironman Florida at the same time and did those long 100 mile rides on the levee together! I had a moment with her and I should have put my glasses back on for our picture! ha. That gave me the last little push to finish it out and call it a day. I own it, I teared up. I finished, not the way I planned but none of my training went the way I planned for the past month. I ended my trip with heading to Publix for the Cuban’s to bring home with me. Dust and I would always bring them back with us and freeze them (they do really well). I had planned on bringing a couple back for him but we know that story. At the airport, I went to our spot at Cigar City Brewery. I had my Jai Alai and thought of our good times there. I was texting with one of my friends, Greg, and started tearing up. The bartender asked if I was okay and I told him about Dustin and I’s tradition. And I felt some peace in that. I know there are good days and probably some not so good days ahead. But I know I am surrounded by the best people in the world. Knowing that Dustin told a couple of our close friends, if anything ever happens, look out for her; they’re doing just that and I love him more for thinking about something like that – no one should but that was his line of work. It’s still very surreal. It’s already been a month since he left ALL of us. I always knew he was special but to know how he left different impressions on each and every person’s life, he has a legacy. I’m going to continue being raw and vulnerable on this blog. I want you all to know more about him, about us; you know – only the good stuff though. Grief is a strange thing and everyone processes it differently. I’m going to harness the pain and go about it the way I know he would want me to; through training and racing. I haven’t written in a while and thought hmmm, maybe a guest post would be a good idea to get me jump started again. One of my teammates, Tim Talbot, from Venom Multisport Racing (based in New Orleans) recently FINISHED HIS FIRST IRONMAN!! Whoohoo! What an accomplishment! Well, he wrote a race report for Ironman Florida and I asked him if I could post it for him since he’s e-mailing it out to everyone (I know he has a lot of time post IM training but not that much! lol) – he agreed and here it is! Enjoy! “The temperatures the week before the race were extremely unpredictable since Hurricane Sandy had just passed through. The forecasts were all over the place in terms of temperature. I decided to pack all my warm weather and cold weather gear so I would be prepared for anything. Since this would be the biggest endurance race of my life, I figured I would start getting anxious or nervous as the days got closer to race day. However, I was not nervous at all. Me and some friends agreed to caravan to PCB. We arrived on Thursday around noon and headed straight to athlete check in. There were no lines and the volunteers were extremely friendly as usual. I saw some other friends in the registration tent and shared some hugs and well wishes. So now I was all checked in, still no nervous jitters. Hmmm. Friday morning I got up early and went for a really short swim with some friends, some friends from New Orleans and some from Florida that I met while standing in line to register last year. It was great to see them again. After our swim, we went for a short bike ride to make sure everything was working correctly. When we were out on the bike, I noticed the pancake breakfast was being served outside, so we pulled in, got some pancakes and ate on the curb. (We weren’t the only ones doing this) After breakfast I packed my transition and special needs bags. I drafted a checklist weeks before and even checked them off as I put them in the bags, but for some reason I had the urge to continuously check them. I was starting to feel like I had OCD as many times as I dumped everything out and checked to make sure I had everything. After that, I headed down to drop off my bike and transition bags. I was sharing a condo with my friend/cousin-in-law. His family arrived shortly after we dropped off our bikes. They did not eat lunch on the way in so he left with them to grab some lunch. Since my family wasn’t due to arrive until later in the day, I was left in the condo for a few hours alone. I used this time, not to sleep, but just to clear my head and get myself mentally ready for the day I had ahead of me. I really needed that time. Still, not nervous. When my family arrived, my daughters were dying to go swim. I took them down to the pool so they could play for a little while before we ate dinner. I was so happy they were going witness their daddy accomplish this huge goal. Granted, the youngest (Alaina) had no clue what I was doing, but I think my oldest (Madison) had some idea of what I was doing. Race morning I was up at 4AM to start eating. I had two bananas, a half of a bagel, and a bottle of Gatorade. I looked out to the beach that morning from the balcony and I couldn’t see the surf, but I could hear it. All I could think about was the rough waters I swam in back in May for the 70.3 on the same course. (6-8’ seas) I didn’t let it bother me, I had survived once and I would do it again if needed. It was also much warmer than I would have liked it to be, but at least it wasn’t freezing. At 5:00 we headed down to transition, still not nervous. As with most triathlons, the volunteers are awesome. I got body marked and headed right into transition. Since all of my “stuff” was put in my transition bag the day before, there really wasn’t anything to set up in the morning. All I had to do was put all my nutrition on my bike and fill my aero bottle. I had arranged a meeting spot on the Boardwalk for my family to meet me since they weren’t walking down as early. After I had everything set up, I headed to our rendezvous spot. My wife and kids were there along with my parents and my cousin-in-laws family. We took pictures gave kisses and hugs then headed to the beach. I’m still calm as can be. When I got to the beach, I noticed the surf wasn’t nearly as bad as the race in May. I was happy with that. The time seemed to be flying by. Before I knew it the male pros were heading out for their swim. Ironman had brought in a female from one of the armed services to sing the national anthem, I think she was in the Airforce. She sang it beautifully. I always get emotional when I hear our Anthem, but it when it is sung so beautifully from a someone in the service, it has way more meaning than listening to recorded version without the lyrics. They asked us to start moving toward the water after the anthem was done. I was really getting excited at this point. I saw some friends on the beach. We traded hugs and well wishes as we made our way towards the water’s edge. At this point, I figured since I never did get nervous, it wouldn’t happen. I guess subconsciously I knew I was well prepared. Or just dumb! When the canon blew, it’s a giant mass of 2500+ people running into the water. My plan was to just keep swimming and don’t stop unless something happened. I didn’t want to get run over by everyone behind me. It turned out to be exactly what I was expecting; every man for himself. I tried to stay away from the feet of other athletes since I like my teeth. I did get kicked, grabbed, and punched several times, but it is best to stay calm and keep moving. That type of stuff doesn’t make me nervous in the water, so it was no big deal. The turns on the swim were pretty brutal, but still nothing I didn’t expect. I had worn a cheap Timex watch just to keep track of my total time. Well, it is now at the bottom of the gulf. Someone’s hand hit it on the first turn. Oh well, hopefully that would be the only thing that would try to ruin my day. I certainly could have thought of worse things to happen in that washing machine of people. 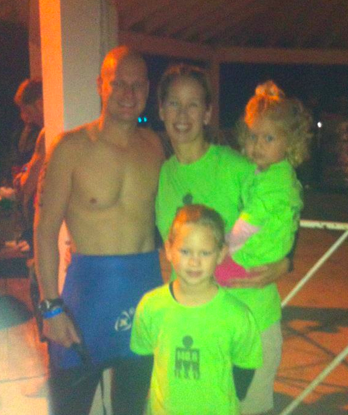 As I ran down the beach heading to do my next lap, I saw my family cheering as I went by. It was awesome! I wasn’t able to get into a good swim zone until after the second turn on the second loop. I managed to find “clean” water in that section and stay away from people for the most part. As I neared the beach, I could hear the crowd and the announcer. I had done it. I survived 2.4 miles of Ironman Florida. A friend of mine, and ironman, said that at some point during the three events I need to just look around and think, “I am doing Ironman Florida!” When I was coming out the water, that thought was the first thing that came to mind. I blew past wetsuit peeling to avoid getting sand where I didn’t want it even though some friends and family had volunteered to peel suits. I gave them a quick wave and headed straight to transition. In T1, the volunteers were awesome. They opened my bag and laid everything out and handed things to me as I needed them. Then, I was off for a little bike ride. I was warned by several people to take it easy on the bike out. I did, and I think 150 people passed me within the first 20 miles. I immediately got into my nutrition plan. I really think that is what made the time go by quickly. After about 30 miles I was starting to wonder why I didn’t need to pee. Everyone says you should pee at least twice on the bike or you will be dehydrated for the marathon. Miles 50-60 were terrible. The road was so rough there were water bottles, tool kits, nutrition, etc that had fallen off of bikes. I did stop around mile 57 to make myself pee. It didn’t seem like very much compared to the amount of liquid I was taking in. When I finally got back on smooth road, the headwinds started picking up. I really wanted to start hammering it since I slowed on the bumpy road, but I was letting my heart rate dictate how fast I went. I felt like I was being conservative, but I really didn’t want to walk the marathon. I started passing people around mile 85. I wonder if those were the people that blew past me in the earlier part of the ride. At mile 98 there is a decent size bridge to cross. From the bridge back to transition, I bet I passed 100 people. I was feeling great, but no doubt, I was ready to get off the bike. And, I was still concerned that I had only peed one time. The volunteers in T2 were just as awesome as T1, laying all my stuff out and handing it to me as I needed it. Heck, he even sprayed sunscreen on for me. I tried not to think that I was about to go run 26.2 miles. Since the course was two loops, I decided to break it up in my mind to 4-10Ks. Right as I come out of transition, I see my wife and kids. I give kisses to all of them. Words cannot describe the emotions. As I run off I want to cry, but I learn quickly that it is impossible for me to cry and run. Go figure. I felt pretty good for the first couple miles then I started feeling bloated. After about 5 miles I figured out it was just gas. 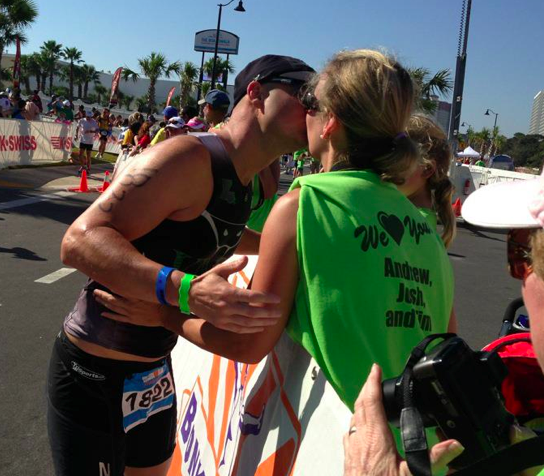 Once that came out (Not everything about triathlon is glamorous.) I started feeling much better and in the words of Forrest Gump, “I just kept running.” I walked through every aid station to get water to drink and pour on my head to help keep cool. I had started running at the hottest part of the day. It had to be at least 85 degrees. After stopping to pee, 4 or 5 times and I realized I wasn’t in danger of dehydration so I started bypassing some of the aid stations on my second loop of the marathon. I was warned by several people that mile 18 was the worst part of the marathon of an ironman. I was anticipating that point. I saw the mile marker and felt great. Maybe it would be mile 19 for me. Nope. Maybe 20. Nope. At this point it was all mental. It seem like I was the only one running out there. Everyone else was walking. I was determined to run the second loop faster than the first. So I was pushing as hard as my legs would carry me. I saw lots of friends on the run course and the spectator support in some areas was just plain out awesome. When I made the turn back onto the street Alvin’s Island is on, I could see the lights and hear the crowd and announcer. The emotion came back and still couldn’t cry. I put my hands on my head and looked to the sky and thought, I did it! I kept pushing. When I got to the area where the special needs bags are, there are two directions to run. One way is to go back for another loop, the other; to finish. When the crowd saw me head for the finisher chute, they went crazy. Cue emotions. Several friends that have completed an ironman have told me to enjoy the chute, don’t sprint through it. So I slowed down and started giving high fives. It was truly awesome. I couldn’t really see past the finish line since they have such bright lights for the pictures. A friend and training partner had volunteered and he greeted me at the finish line. His exuberance was priceless. I then saw my family coming to greet me. Cue emotions again. I did it. I am an Ironman. I still get emotional when I think about it and even did while writing this. I managed to run the second loop of the marathon 7 minutes faster than the first. I am very pleased with my time and I will definitely do another iron distance race again. TIM, YOU ARE AN IRONMAN!! I loved seeing everyone out there that I had trained with one time or another throughout my journey. It is a bond we will have for a lifetime. When I arrived back to the room, my wife had warned me that she blew up my Facebook page. She wasn’t lying. All day she had posted my progress. The support and encouragement from everyone was astounding. CONGRATS TIM!! YOU ARE AN IRONMAN!! !